In the 1960s, three Swiss men became partners in a venture now known as The Laderach Group. Today, the company is perhaps most well known for the Heidi (bar) brand. 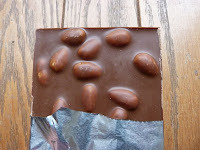 The Milk Chocolate Caramelized Almonds bar featured here was produced in Romania -- specifically near Bucharest, in Pantelimon, Romania -- before being imported to the U.S. Today, Laderach individual chocolates and bars are found 'round the world. 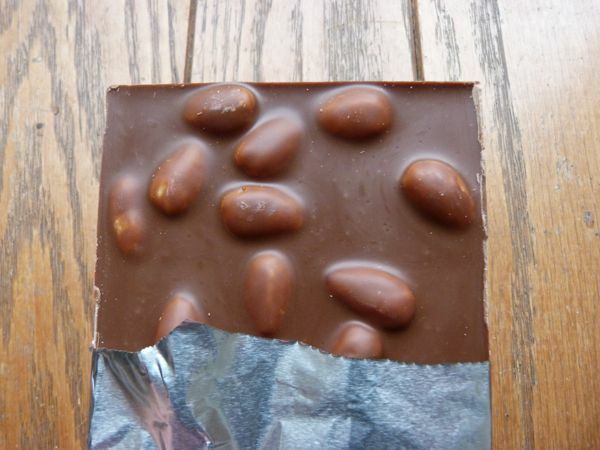 The milk chocolate was a bit sweet for my taste, but it paired well with the caramelized, roasted almonds. Where are the currants mentioned above? 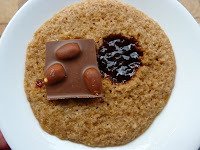 They were chocolate accompaniments, in the form of a currant jam cookie and current tea ...See below. 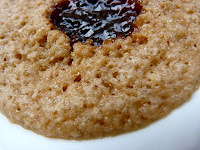 I made some gluten free vanilla almond cookies with red currant jam in the center. 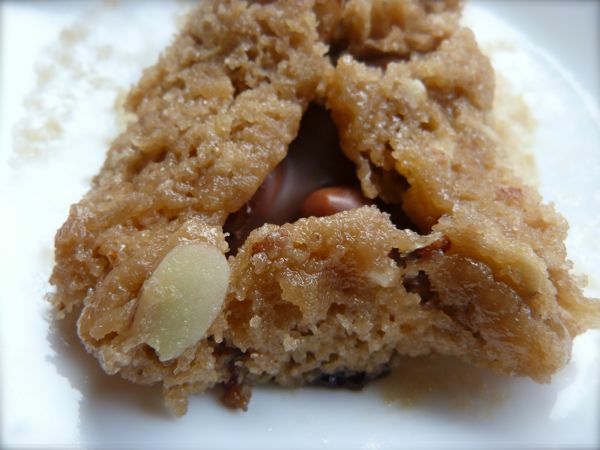 While still bubbling hot from the oven, and pliable, I dropped a small piece of chocolate (including a square of today's Heidi bar with almonds) in the middle of each cookie. I carefully folded up the cookie edges on three sides to make a triangular shaped pocket cookie. What resulted was something like an almond nutella and jam sandwich (and vaguely similar to a three-cornered hamantash cookie). And, I enjoyed one of these cookies with a cup of homemade currant citrus tea described below. Let soak in large glass jar or container: 1 tea bag (optional); 5 Tbsp. red or black currant jelly or jam (I used Bonne Maman red currant jelly), 2 1/2 cups room temperature water, 3 Meyer lemon slices, 2 orange slices, 1 lime slice, tiny pinch of powdered cinnamon and ginger. 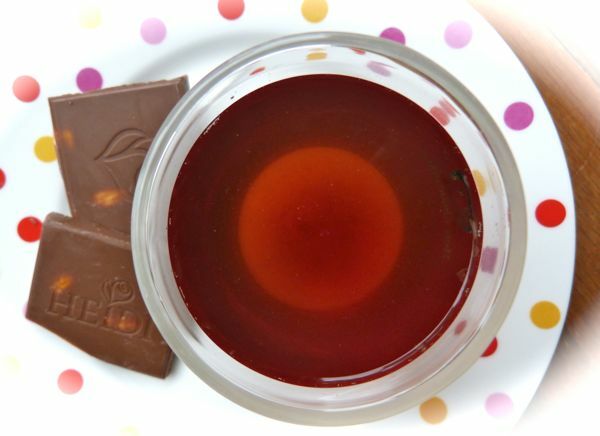 Stir mixture until jam is dissolved; soak (covered) overnight; strain; and serve hot or cold. Serves 2-3. *Note: Chocolate Banquet theme weeks consistently spill-over into more than 7 days, and overlap with other theme weeks, as there are always new chocolates being discovered and new combinations to be tried.